The RBI is making strong efforts to require banks to recognise early stress triggers in loan accounts in order to ensure adequate provisioning and timely recovery, and the Indian government is making efforts to augment the capital base of public sector banks to provide a buffer against asset stress. Several positive measures have been introduced in the recent past, with mixed results. The RBI’s schemes for effecting strategic turnaround of companies (with greater creditor control over management) found few takers, and have been completely replaced by a new framework. The recently notified Insolvency and Bankruptcy Code, 2016 (the Insolvency Code), however, while still in its early stages, is proving to be a game-changer for corporate debt in India. Simultaneously with efforts to discourage large borrowers from depending solely on the banking system for funding, the RBI and the government of India have attempted to open up new lending avenues for Indian corporates. The RBI has also made efforts to strengthen the framework for the sale of NPAs by banks to institutions that may be better able to recover those assets, such as securitisation vehicles or non-banking financial companies (NBFCs). As an outcome of these efforts, NBFCs and new lending entities (such as foreign portfolio investors (FPIs) and alternative investment funds (AIFs)) have significantly increased their share in the market in recent times. With Indian corporates looking for new (and cheaper) sources of funding, new lending avenues such as ‘masala bonds’ (i.e., rupee-denominated bonds issued offshore by Indian corporates) have seen some success, with Indian corporates issuing US$67 billion worth of masala bonds. Given the volatility of the Indian rupee in recent times, these bonds have become popular, as they eliminate the currency risks associated with offshore borrowing. The RBI has also made certain relaxations in the existing external commercial borrowing framework5, benefiting corporates looking to raise foreign currency loans to meet their capital needs. Some of the changes include making uniform the applicable cost ceilings to different types of offshore loans, including foreign currency loans and rupee denominated bonds and removing erstwhile stipulations on the end-use of such loans (only a limited negative list has been specified, restricting the use of such loans for investment in equity, capital markets and real estate (among others). The corporate insolvency resolution under the Insolvency Code has created an avenue for acquisition and leveraged finance in India, which we expect to further pick up in the next few years. As the Insolvency Code excludes corporates in the financial services sector from its scope, the Financial Resolution and Deposit Insurance Bill, 2017 was tabled before the Indian Parliament to establish a framework to carry out the resolution of specified categories of financial service providers in distress, and for designation of ‘Systemically Important Financial Institutions’ by the central government.6 It remains to be seen whether these measures impact lender behaviour in India. Indian creditors do not usually adopt Loan Market Association (LMA) or Asia Pacific Loan Market Association (APLMA) standard documentation, and each creditor may use its own format of loan documents.7 Indian loan documentation is typically covenant-heavy on the borrower (especially in a special purpose vehicle or project financing). The focus of the Indian banking sector continues to be on resolution and restructuring of bad loans to reduce the gross NPA ratio, with the RBI introducing new measures to guide lenders to quick resolution. Following the constitution of the National Company Law Tribunal for companies and notification of the Insolvency Code, the ‘corporate insolvency resolution process’ under the Insolvency Code has seen an upswing. Different types of creditors in India are subject to differing levels of government oversight and scrutiny. Banks in India are heavily regulated, with RBI guidelines governing interest rates, extent of exposure to corporate groups, information sharing and reporting requirements and other prudential aspects. Indian regulations permit NBFCs to engage in lending business if they register with the RBI, although NBFCs are subject to lesser scrutiny. The RBI has introduced several measures aimed at reducing regulatory arbitrage between banks and NBFCs.8 The RBI and the Securities and Exchange Board of India have introduced lightly regulated lending vehicles such as AIFs and FPIs in order to widen the Indian investment market. Certain changes have been introduced to the FPI regime, which are detailed in Section VII. The RBI had introduced several out-of-court schemes such as strategic debt restructuring (SDR) and Scheme for Sustainable Structuring of Stressed Assets (S4A), which were aimed at giving banks greater management and control over borrowers in the restructuring process. Given the limited success of these schemes (SDR was successfully implemented in only two cases, as was S4A), on 12 February 2018 the RBI issued a circular that overhauled the framework of restructuring schemes in India. By way of the circular, all the earlier restructuring schemes devised by the RBI, as well as the framework for constitution and regulation of joint lenders’ forums were withdrawn, and replaced with a single resolution framework. 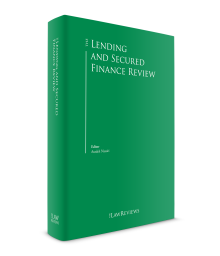 Under the circular, lenders are required to initiate the process of formulating a ‘resolution plan’ for the borrower, which may include a change in ownership, debt restructuring, etc., within six months of a default by a borrower, failing which the lenders are mandated to refer the borrower to insolvency resolution proceedings under the Insolvency Code.9 Absent exhaustive intercreditor arrangements, the resolution plan formulated in respect of a borrower would require the consent of each individual lender. Further, the disqualification criteria applicable under Section 29A of the Insolvency Code has also been made applicable to a resolution plan contemplating change in ownership of the borrower. The revised framework has currently only been made applicable to banks, and not to other lenders such as non-banking financial companies and asset reconstruction companies, which were hitherto able to participate in the process of resolution under the erstwhile regime. Historically, however, the RBI has extended applicability of similar circulars to non-banking financial companies, and the same may be expected in respect of this circular as well. Several important positions have already been taken by courts since the commencement of the Insolvency Code. These include a recent decision of the Supreme Court to disallow out-of-court settlements post the initiation of an insolvency process against a borrower, prohibition of recovery actions against guarantors of a company undergoing a resolution process and the Supreme Court declaring itself to have the authority to terminate proceedings under the Insolvency Code in case the borrower has settled all claims raised against it as on the insolvency commencement date (although this specific ruling was held not be treated as a precedent of general applicability). Several important amendments have also been made to the Insolvency Code, in order to address the various issues that have cropped up during its implementation. One such significant change was the inclusion of Section 29A,11 by way of which stringent eligibility criteria was introduced in respect of prospective resolution applicants to a distressed company (i.e., those seeking to submit resolution plans in respect of the insolvent entity), which prohibited promoters and companies with an unclean record or bad history in the credit market, from bidding for the insolvent company.12 The disqualification criteria under Section 29A are also triggered where a disqualified entity or person is a ‘connected person’13 of the resolution applicant. The treatment of convertible and structured instruments in an insolvency proceeding remains to be tested. Further, the provisions of the Insolvency Code that allow operational (trade) creditors to file proceedings against borrowers for smaller defaults have caused many creditors to strengthen cross-default clauses in loan documents, while also imposing stricter covenants on borrowers with respect to trade creditors. The National Company Law Tribunal (NCLT) and the National Company Law Appellate Tribunal (NCLAT) were constituted in June 2016. These are meant to serve as a single window for all company law disputes, assuming powers previously exercised by High Courts, the Company Law Board and the Board of Industrial and Financial Reconstruction. The NCLT also functions as the adjudicating authority for all matters under the Insolvency Code (with the NCLAT functioning as the appellate authority), and has had to deal with the immense proliferation of cases right from the time of the commencement of the legislation. In this respect, the infrastructure of the NCLT has been seen to be requiring improvement, with the number of benches and appointed members being insubstantial in relation to the caseload being assigned to them, thereby resulting in inordinate delays. A recent study14 that was conducted, shows that the average time for the disposal (acceptance or rejection) of an application for the initiation of a resolution process under the Insolvency Code is 24 days (the outer limit prescribed under the Insolvency Code being 14 days). Basel III implementation has commenced in a staged manner in India, with full implementation expected by 31 March 2019. While it is generally expected that implementation of Basel III may increase lending rates, unlike LMA and APLMA jurisdictions, domestic creditors have not introduced a concept of ‘increased costs’ for Basel III implementation in loan documentation. Foreign creditors in India, however, adopt the LMA standard of reserving a right to claim increased costs from the borrower, subject usually to negotiated caps. Sanctions and anti-corruption laws were previously broadly subsumed by Indian creditors within the representations and covenants on compliance with all applicable laws. In recent times, based on recommendations of the Financial Action Task Force and the Basel Committee, the RBI has issued various guidelines on compliance by banks with these standards15 in respect of monitoring accounts and reporting of suspicious activity. Banks are also now subject to enhanced ‘know your customer’ (KYC) requirements, which are tailored to meet these guidelines. Most domestic banks require borrowers and security providers to complete a comprehensive KYC as a condition precedent to disbursement. International banks as well as domestic banks with a presence in the United States and the European Union may additionally require borrowers to comply with requirements of the Office of Foreign Assets Control regime or the relevant EU regime. Typically, creditors do not look to extend compliance requirements beyond these regimes (except in transaction-specific cases). Given the recent spate of financial frauds,16 the government of India has introduced the Fugitive Economic Offenders Ordinance, 2018,17 which came into force on 21 April 2018. The Ordinance is intended to lay down measures to empower Indian authorities to attach and confiscate properties and proceeds of crime (in or outside India) associated with economic offenders who have left India or are refusing to return to India to avoid prosecution. Offenders will be tried under existing laws such as the Prevention of Money Laundering Act, 2002. The efficacy of these measures is yet to be tested. While RBI guidelines permit banks and NBFCs to determine interest rates linked to market determined external benchmarks (such as the London Interbank Offered Rate), most domestic lenders adopt the ‘marginal cost of funds based lending rate’ (MCLR). In April 2016, the RBI replaced the existing interest rate system with the MCLR. Under the MCLR, the lending rate is also pegged against change in rates and costs of borrowing by banks, including the repo rate. The MCLR adopts a tenor-based benchmark, and the final lending rate offered to individual borrowers includes the ‘spread’ over and above the MCLR. An Indian borrower is required to withhold tax payable by a non-resident creditor on interest. Interest payable on a foreign currency denominated loan is subject to a withholding tax of 20 per cent (plus applicable surcharge and cess),18 while interest on a rupee-denominated loan is subject to withholding tax of 40 per cent (plus applicable surcharge and cess). A lower withholding tax rate of 5 per cent (plus applicable surcharge and cess) may be available where an Indian company avails itself of a long-term foreign currency loan, or issues long term foreign currency or rupee denominated bonds, subject to fulfilment of certain prescribed conditions linked to the Indian exchange control regulations.19 Interest on loans to Indian borrowers outside India for their offshore businesses is not subject to withholding in India, while loans taken out in India are subject to withholding taxes. Non-resident creditors and FPIs may also be eligible to avail themselves of beneficial tax rates available under India’s vast array of double tax avoidance agreements (DTAAs). Certain DTAAs exempt interest income from tax, should the interest be paid to certain specified creditors (such as government, specified governmental agencies, financial institutions and statutory or local authorities, etc.). The rate of withholding tax on interest varies from 7.5 per cent to 40 per cent as per the DTAAs executed by India. The introduction of the Goods and Services Tax in India may impact the cost of lending, since increased service tax will be leviable on banking services. Documentary (or stamp) taxes are payable on every document signed in India or signed outside India but brought into India (including in some states, in electronic form). Therefore, if creditors anticipate a document being brought into India (for instance, to enforce), stamp duty is usually paid at the time of signing. Rates of stamp duty on most documents are determined by the respective state governments for where the document is to be executed or for the location of the immovable property concerned. While some states (such as Delhi, Gujarat, Telangana and Andhra Pradesh) have lower stamp duty rates (with loan agreements subject to rates between US$3 and US$10), states such as Maharashtra impose a significantly higher stamp duty, at 0.2 per cent of the amount being lent. The rate of stamp duty payable on various types of security interests also varies significantly (from US$0.15 in Andhra Pradesh to US$15,500 in Karnataka) and is a consideration for creditors while choosing their security package. Following a 2015 judgment of the Supreme Court of India,21 although collateral is created in favour of a single agent or trustee in consortium lending, security documents are required to be stamped as though executed separately in favour of each creditor. Loan trading transactions attract stamp duty. While novation of commitment may attract a nominal stamp duty (since stamp duty is already paid on the loan agreement), stamp duty on an agreement for assignment of a loan and receivables (being treated as a conveyance of movables) attracts stamp duty ranging from 3 per cent to 14 per cent of the loan amount being assigned. In order to give a boost to the securitisation market in the country, however, the legislature has recently exempted securitisation transactions involving the transfer of rights or interest of banks or financial institutions in financial assets from stamp duty incidence. Typically, the adequacy of stamp duty on instruments is tested when: (1) they are sought to be registered or otherwise presented to a public authority who has the authority to impound such documents under the stamp laws; or (2) they are sought to be enforced or relied on as evidence (in court proceedings or private dispute resolution proceedings such as arbitration). While the obligation to pay stamp duty is usually borne by the borrower under loan documentation, in the state of Maharashtra, creditors are liable to pay a penalty equal to the stamp duty on any instrument creating rights in their favour that is inadequately stamped. Documentation is typically structured in a manner that minimises stamp duty incidence (such as by executing in states that have a lower stamp duty rate and agreeing to jurisdiction clauses of such state). From 2015, the Foreign Account Tax Compliance Act (FATCA) and Common Reporting Standard (CRS) have become applicable in India, under the inter-governmental agreements executed by the Indian government. These arrangements have been implemented in India by requiring financial institutions to share relevant data with the Central Board of Direct Taxes, which will then transmit this information to the relevant offshore authorities. The RBI has also modified its KYC and reporting guidelines applicable to lending institutions to incorporate the FATCA and CRS requirements. Creditors typically address FATCA compliance by requiring the borrower and other creditors to confirm their FATCA status, and each party bears its own FATCA deductions, with no gross-up (similar to the LMA arrangements on FATCA). Creditors can choose from a variety of security options to safeguard their exposure to borrowers and minimise risks associated with lending in India. Typically, high-value transactions involve the creation of multilayered security packages. While creditors may have preference for the type of security that is to be created, industry and company-specific diligence plays a key role in charting out strategy for assets to be secured as well as the type of security interest to be created, to ensure the highest degree of protection. A mortgage is a transfer of interest in immovable property to secure an existing or future debt or the performance of an engagement that may give rise to a pecuniary liability. While there are different types of mortgages that may be created in India (such as usufructuary mortgage, mortgage by conditional sale), in secured lending transactions involving immovable property as security, typically a mortgage in the English form or by deposit of title deeds is created. Many traditional lending institutions in India still require a borrower to mortgage some immovable property for any lending, since this is seen to provide a greater assurance than security over movable or financial assets. Working capital is typically secured by receivables and the stock-in-trade of the borrower. A mortgage in English form is the preferred form of security, since it involves a complete transfer of property to the creditor subject to the right of redemption of the mortgagee. It is typically associated with ease of enforcement, since a creditor has private remedies available (such as appointment of a receiver for the property) under law and does not have to rely on a court process for protection or enforcement of security. There is ambiguity regarding whether such remedies are available to foreign creditors, however. Legal structuring of a mortgage in English form allows borrowers to charge or assign movables, contracts and other assets along with the immovable property, affording the benefit of private remedies and ease of mortgage enforcement to all such assets. A mortgage in English form can, thus, effectively secure all assets of the borrower. A mortgage by deposit of title deeds requires the deposit of title deeds of the property with the creditor with an intention to create security over such property (usually demonstrated by a declaration issued by the borrower at the time of deposit of the title deeds). Such mortgage can be created only over immovable property and, therefore, does not afford the convenience of stapled security, unlike a mortgage in English form. A pledge is a special form of ‘bailment’ under law and, therefore, requires actual or constructive delivery of possession of the assets being pledged. Since transfer of possession restricts the ability of the borrower to use the secured assets, a pledge is usually created over shares and financial assets, which are not required for day-to-day operations. Such a pledge is created by handover of the share or security certificates to the creditor, or if the securities are in electronic form, by the marking of a pledge over the securities in the records of the depository,22 which ‘locks’ the securities and does not permit any transaction without the consent of the creditor. Pledges are usually accompanied by a power of attorney in favour of the creditor (or the trustee) for exercise of rights in respect of the securities on the occurrence of a default. Pledges are taken as security in all kinds of financing, including project financing and mezzanine or structured financing, since they allow borrowers to leverage financial securities held by them and provide ease of enforcement. Upon a default by the pledgor, a sale of the pledged assets can be effected without court intervention, and the proceeds can be used by the pledgee to discharge the pledgor or borrower of its obligations. Indian law also recognises retention of title clauses and provides for security in the form of a lien to unpaid sellers. While movable assets are frequently ‘stapled’ with immovable property in an English mortgage (see ‘mortgages’, above), where immovable property is not available or is being secured by a mortgage by deposit of title deeds, creditors require the borrower to charge its movable assets (physical assets, financial assets and non-physical assets) under a hypothecation document. While a standalone mortgage over movable properties has also been recognised, this is not the usual route adopted by creditors in India. A hypothecation is recognised in Indian law as a charge on existing or future movable property without delivery of possession. It is a contractual creation of a special property in assets, entitling the creditor to take possession of those assets in a default and sell them for realisation of outstanding debt. Both fixed and floating charges are recognised in India. In most public-private partnership projects (e.g., roads and airports), the government continues to own the project asset, with a concession being granted to the borrower to develop and operate the asset. Similarly, several assets such as telecoms, spectrum, mining rights, etc., are owned by the government and licensed to private parties. These assets cannot be charged directly to creditors. Therefore, government authorities enter into tripartite arrangements with creditors, under which they allow the creditors a right to substitute the borrower with an eligible third party (subject to certain conditions). However, the sanctity of such arrangements is not clear. contractual rights, receivables, intellectual property, etc., by way of a mortgage (if stapled with land) or a hypothecation. Additional perfection rights may be required depending on the nature of the asset (e.g., creation of charge over aircraft is required to be endorsed on the certificate of registration with the Directorate-General of Civil Aviation). With respect to intellectual property, creation of any security interest is required to be notified to the relevant registration authorities. Foreign creditors also require a no-objection certificate from the relevant authorised dealer23 prior to creation of security over any Indian assets in their favour. Enforcement of a security interest may be done either privately or through court intervention. A typical private enforcement process would take about two to four years, whereas a court process may extend to about 10 to 12 years. A mortgagee has the right to file a suit for foreclosure or sale on default in repayment; however, such rights have not been extended to foreign creditors under the Indian transfer of property regime. Thus, while foreclosure is not an option for mortgages in English form or foreign creditors, creditors holding a mortgage in English form are permitted to effect a private sale of the property or appoint a private receiver without approaching a court. The enforcement of a charge over movable assets requires the intervention of courts unless the terms of the underlying contract expressly provide for it. For a pledge, a creditor may simply sell the pledged assets in accordance with the terms of the underlying contract and after giving reasonable notice to the pledgor. Creditors have a duty to maximise recovery from secured assets. The Securitisation and Reconstruction of Financial Assets and Enforcement of Security Interest Act, 2002 (the SARFAESI Act) provides creditors private remedies to enforce any security interest (except a pledge on movable assets or a lien). Where a substantial part of the business is held as collateral by the creditors (such as in a project financing), they are also permitted to take over the management of the borrower. In cases of consortium lending, approval of 60 per cent of the creditors in value is required for exercise of powers under the SARFAESI Act, and such approval is binding on all creditors (including dissenting creditors). The remedies under the SARFAESI Act are also available to the listed bond market in India and to notified non-banking financial companies. Debt recovery tribunals (DRTs) have been established in India under the Recovery of Debts Due to Banks and Financial Institutions Act, 1993. Creditors (including secured creditors who have not received full repayment from enforcement of security) may apply to the DRTs for recovery of debt. Recovery officers of the DRT are empowered to, inter alia, attach property of the borrower (even such property that is not offered as collateral) and require third-party debtors of the borrower to repay debt amounts to the officer. The efficacy of approaching the DRTs to seek recovery of debt is severely hampered by an immense backlog of cases. It is estimated that there are over 100,000 cases pending before the various DRTs.24 It has also been a common grievance that the officers appointed to such tribunals are highly inexperienced and lack the requisite training to adjudicate on debt-related issues. Under extant foreign exchange regulations, foreign creditors require authorised dealer approval for enforcement of security and repatriation of proceeds. Further, enforcement would also need to comply with generally applicable foreign exchange restrictions, including that the sale of immovable property can only be to a resident and any invocation of pledge is to be in accordance with the foreign investment policies. Any creation of security over a company’s assets needs the approval of the Board of directors of the company, by way of a physical meeting. Creation of security over assets exceeding specified valuation thresholds or of third-party security for a loan to a group company also requires approval of three-quarters of the shareholders of a company. In case of third-party security, additionally, the loan for which security is provided is required to be used for the principal business activities of the borrower. All charges (including mortgages, pledges, lien, etc.) created over the property and assets of a company are to be registered with the Registrar of Companies within 300 days of the date of creation of the charge for the security interest to be enforceable as regards the company’s creditors and its liquidator, for a fee ranging between US$3 and US$9. Mortgages over immovable property (other than by way of deposit of title deeds) are also required to be registered with the sub-registrar of assurances in whose jurisdiction the property is situated. The registration fee varies across various states and may either be a capped amount (US$461 in Maharashtra) or ad valorem in respect of the amount secured. Mortgages by deposit of title deeds are required to be noted in the land registry in certain states. Creditors are required to file details of mortgages created in their favour with the Central Registry of Securitisation Asset Reconstruction and Security Interest of India (CERSAI) under the SARFAESI Act. Additionally, specific assets may also require additional registration (for instance, the assignment or transmission of rights in relation to patents is required to be filed in the register of patents). By way of a recent amendment to the SARFAESI Act, it was proposed that the central government integrate all registration systems for recording security interests over all types of assets (which are currently regulated under diverse legislations such as the Companies Act, 2013, the Merchant Shipping Act, 1958 and the Patents Act, 1970) with the CERSAI. This integration process has not yet been made effective. under Indian transfer of property laws, there may be dual ownership over fixed assets and the land on which such assets are located. This creates complications for the purposes of enforcement of security by creditors. Corporate guarantees are usually sought by creditors from the parent or from associated companies of the borrower entity. Although guarantees are executed as deeds (and, therefore, do not require consideration to pass to the guarantor), most creditors require the guarantor to demonstrate consideration in the form of a corporate benefit accruing to it. Given India’s traditionally promoter-driven corporate market, creditors have historically required individual promoters to provide personal guarantees for corporate loans. Creditors also require promoters to provide personal guarantees as a condition of restructuring loans, on the principle that shareholders should bear the first loss. In view of the burgeoning NPA problem (see Section I, above), the RBI in 2014 allowed banks to classify guarantors who refuse to honour guarantees as ‘wilful defaulters’, restricting access to capital and debt markets. With the increasing focus on guarantors by both banks and regulators, many corporate groups resist guarantees by individual promoters. Creditors as beneficiaries of guarantees are also able to take the guarantor (following invocation) to a corporate insolvency resolution proceeding under the Insolvency Code. Given a recent spate of judgments in the context of invocation of guarantees during CIRP of the borrower,25 the nature and timing of invocation of guarantees has received significantly more interest from creditors. Group company guarantees require a host of corporate compliances to be met, including approval of the shareholders of the guarantor and a condition that the loan should be used by the guarantor for its principal business activities. As is the norm globally and with the changing landscape of insolvency laws in India, secured creditors continue to have better protection and preferential access to borrower assets than unsecured creditors.26 Certain encumbrances created under law also have priority over secured creditor rights (such as banker’s lien and an unpaid vendor’s lien). Since these rely on a preferential status by virtue of possession, priority rules gain significance in the context of non-possessory securities (such as charges and mortgage). the registration and fulfilment of perfection requirements of a charge give it priority over a non-registered and non-perfected charge, notwithstanding when the charge was created. Contractual priorities in security are usually set out in an intercreditor or subordination agreement between the creditors. Intercreditor arrangements include turnover provisions (requiring subordinated creditors to turn over any out-of-turn recoveries to senior creditors) and trust provisions (whereunder subordinated creditors agree that any out-of-turn recoveries will be held in trust for senior creditors). Intercreditor arrangements are fairly standard and are afforded sanctity by courts as well as participating lending institutions. It remains to be tested whether turnover subordination provisions will be binding on a liquidator appointed under the Insolvency Code or the Companies Act, 2013. Typical LMA and APLMA provisions requiring majority creditor consent for enforcement or other action against a borrower or obligor are viewed as unenforceable under Indian law, since the Indian Contract Act, 1872 holds contracts restraining legal proceedings to be void. Therefore, enforcement priority in India is maintained by imposing wait periods (up to a year) on subordinated creditors for enforcement. An intercreditor arrangement may become problematic when different types of creditors are party to it, since all creditors do not have equal access to special enforcement mechanisms. For instance, remedies under the SARFAESI Act are not available to foreign creditors who are not registered in India and to certain NBFCs. The imposition of wait periods for access to remedies under the SARFAESI Act also entitles some creditors to invoke remedies under the SARFAESI Act before others. While an intercreditor arrangement may address these issues by requiring creditors who have the benefit of these regimes to share recoveries with other creditors, this results in an unsatisfactory situation where the notified creditors can then not recover their dues as they have (notionally) already received full payment from the borrower. The role of intercreditor arrangements in a debt restructuring will need to be re-evaluated, however, given the RBI’s new framework which requires all lenders to agree to a plan for resolution of stressed assets, and does away with the earlier majority threshold of 50 per cent by number and 60 per cent by value which was binding on all lenders under the erstwhile RBI guidelines for joint lenders’ forum. Although India broadly adopts a pro-creditor approach in ensuring the least possible hindrance in the enforcement of security interests and guarantees, there are certain limitations to enforceability that find their origin in law and apply in a universal fashion. These include the necessity of demonstrating a corporate benefit, aspects pertaining to financial assistance and the existence of clawback risks in the context of insolvency. These issues have been elaborated upon in more detail below. A corporate benefit is required to be demonstrated in different ways, depending on the type of transaction being entered into and the person or entity to whom loans are being advanced or on behalf of whom security interests are being created (e.g., in favour of lenders). There applies a blanket prohibition on loans being advanced or security being created by a company in favour of its own directors or persons in whom the directors are interested. The exceptions to this rule include the provision of loans or security as part of the service ordinarily extended by the company to its employees or pursuant to a scheme expressly approved by the members of the company. The Companies Act, 2013 restricts public companies from giving loans or guarantees, or providing security or any financial assistance in connection with the purchase or subscription of shares by any person (including any shares in its holding company). As the insolvency regime applicable to corporate entities is spread over the provisions of the Companies Act, 2013 and the Insolvency Code, there are several clawback risks that apply depending on the framework under which the relevant antecedent transaction is being scrutinised. These have been set out in the table below. If the transaction was deliberately entered into by the company to keep assets beyond the reach of creditors or adversely affect a person’s claims, such transaction can be treated as a transaction defrauding creditors. A transaction is entered into that involves transfer of one or more assets or consideration that is significantly less than the value of consideration provided by corporate debtor. The issuance of legal opinions is standard practice for the purposes of Indian lending. Such opinions usually contain statements regarding the capacity of the counterparty to execute the necessary documentation and to enter into the transaction. For the purposes of secured lending, such opinions also explicitly comment on the validity of the security interest being created. It is the creditors’ counsel who usually delivers such opinions. However, in some cases, opinions are sought from the borrower’s counsel along with a supporting confirmation from the creditors’ counsel. Decrees passed by courts of a ‘reciprocating territory’ may be executed in India as Indian decrees, except in certain limited circumstances (for example, where the judgment has not been pronounced by a court of competent jurisdiction, where it has not been given on the merits of the case or where it appears on its face to be founded on an incorrect view of international law). The government notifies jurisdictions that qualify as ‘reciprocating territories’ by way of notification in the Official Gazette. So far only 12 jurisdictions have been notified as reciprocating territories, and this list does not include several key jurisdictions, including the US. Judgments or decrees of courts in non-reciprocating territories can be enforced only by filing a lawsuit in an Indian court for a judgment based on the foreign judgment. It is also relevant to mention here that pursuant to certain changes to the framework governing domestic and international arbitration, the scope for challenging a foreign award on the basis of violation of public policy has been narrowed, and awards have been prohibited from being set aside merely on the ground of an erroneous application of the law or by way of re-appreciation of evidence. Loan trading is common in India, with most documentation structures providing for loan trading without borrower consent by way of novation (usually of undisbursed commitment) and assignment (of a disbursed facility). Large loans involve agent and security trustee structures, allowing new creditors the benefit of existing collateral without requiring action on the part of the borrower. In the event of trading of bilateral loans, however, a release and recreation of security with the cooperation of the borrower is inevitable, which has also its own stamp taxes and registration cost implications. See Section III for a more detailed analysis. Sub-participation and risk participation without a change to the creditor on record have seen an increase in Indian markets in light of the NPA issue, with the market having seen a lifetime high of transactions worth over US$15 billion.27 This has encouraged banks to trade stressed assets. Securitisation (i.e., assignment of loans and receivables to asset reconstruction companies (ARCs) that issue security receipts to holders) is governed by the SARFAESI Act, which contemplates transfer of stressed assets to ARCs, which would then undertake recovery measures against the borrower. There has been a big push to promote such entities by the RBI and the Indian government in the recent past, including liberalising foreign investment in such companies. Foreign investment by eligible FPIs is also now permitted in securitised debt instruments issued by ARCs. In September 2016, the RBI permitted banks to sell their stressed assets to other creditors, NBFCs and financial institutions. As per these guidelines, ‘scheduled commercial banks’ are required to identify assets for sale on an annual basis and periodically review the classification of their financial assets. Banks are also required to invite public bids for the same, in order to attract more buyers and improve the price discovery mechanism. Banks have also now been permitted to buy back financial assets that have been successfully restructured by ARCs (other than those that were sold by the banks themselves). There are certain other issues under the current regulatory framework that act impede entities or persons looking to lend in India. Some of these issues are specific to foreign creditors, while others affect domestic and foreign creditors alike. Some of the issues that impact creditors include the new ‘concentration limits’ that have been introduced for FPIs, stipulating that related FPIs exposure to a corporate group cannot exceed 20 per cent of their portfolio and 50 per cent of a single issuance. The earlier ‘lock-in’ which permitted FPIs to invest in unlisted corporate debt securities only subject to a minimum residual maturity of three years has been reduced to one year, although the end-use restrictions continue to be applicable. The changes to the external commercial borrowing regime (discussed in Section I), while aiming to liberalise the regime, have also restricted the access of investment companies and infrastructure investment trusts (among others) to cheap offshore debt. Besides this, there also apply several restrictions on remittances outside India. Any remittance of proceeds from the enforcement of security by a secured creditor may also require RBI approval. Another development that creditors may need to be mindful of, is the notification of the Real Estate (Regulation and Development) Act, 2016, which provides for greater regulation of borrowers in the real estate sector and provides for, inter alia, stringent timelines for the completion of projects and for restrictions on the usage of money received from buyers for purposes other than for the development of the project. The empowered authority under the Act is authorised to revoke the registration of promoters for contravention of provisions of the Act. Lenders to borrowers in the real estate sector may be required to enforce stricter compliance and escrow mechanisms. The Indian lending market is currently in a state of transition, with creditors exploring new structures and avenues for lending on the one hand, and borrowers exploring new avenues for fundraising on the other. While banks are key financial intermediaries in India, their growth and role in the market has been hampered by asset stress. The new measures to tackle the NPA problem as well as the Insolvency Code will assist banks in identifying and addressing bad loans. Until the market settles in India, we expect new institutions and sources of investments, such as masala bonds, high-yield bonds, mezzanine finance, etc., to see significant growth. 1 L Viswanathan and Dhananjay Kumar are partners at Cyril Amarchand Mangaldas. The authors acknowledge the help received from Surya Sreenivasan and Gautam Sundaresh. 2 The RBI is the central bank constituted under the Reserve Bank of India Act, 1934, which is accorded the statutory mandate to govern the functioning of the banking sector in India. 3 Gross NPAs are currently 9.3 per cent of gross advances of scheduled commercial banks in India, increased from 7.5 per cent in fiscal year 2015, https://www.rbi.org.in/scripts/PublicationsView.aspx?id=18061 (last accessed on 10 May 2018). 4 RBI, Report on Trend and Progress of Banking in India 2015–16. 5 RBI A.P. (DIR Series) Circular No. 25 dated 27 April 2018. 6 The Bill is currently before a Joint Parliamentary Committee, which is yet to submit its report to the Indian Parliament. 7 The Indian Banks Association has notified some standard formats, the broad terms of which are adopted by lenders. 8 RBI, Report on Trend and Progress of Banking in India 2015–2016. 9 The timelines are applicable to accounts where the aggregate exposure exceeds 20 billion rupees. 10 While these powers were first exercised by the RBI in June 2017 to refer 12 companies to insolvency proceedings under an ordinance (i.e., an executive order), an amendment to the Banking Regulation Act, 1949 was formally notified on 25 August 2017. 11 By way of the Insolvency and Bankruptcy Code (Amendment) Ordinance, 2017, which was subsequently replaced by the Insolvency and Bankruptcy Code (Amendment) Act, 2017. 12 The disqualification criteria set out under Section 29A include, inter alia: (1) being an undischarged insolvent or wilful defaulter; (2) having an account, or being the promoter of a company that has an account that has been declared to be a ‘non-performing asset’ under the guidelines of the Reserve Bank of India, with a period of one year having elapsed from the date of such classification; (3) being convicted for an offence punishable with imprisonment of two years or more; (4) being prohibited by the Securities and Exchange Board of India from trading or accessing the securities market; and (5) having executed an enforceable guarantee in respect of a corporate debtor against whom proceedings have been initiated under the Insolvency Code. 13 A ‘connected person’ has been defined under the Explanation to Section 29A of the Insolvency Code as: (1) any person who is the promoter or in the management or control of the resolution applicant: or (2) any person who shall be the promoter or in management or control of the business of the corporate debtor during the implementation of the resolution plan; or (3) the holding company, subsidiary company, associate company or related party of the persons mentioned in points (1) and (2) above. 14 Indira Gandhi Institute of Development Research, Mumbai, Watching India’s insolvency reforms: a new dataset of insolvency cases, available at www.igidr.ac.in/pdf/publication/WP-2017-012.pdf. 15 Consolidated in the RBI Master Direction – ‘Know Your Customer’ Direction dated 25 February 2016. 16 Such as the US$2 billion fraud involving Nirav Modi and Punjab National Bank. 17 The proposed Bill was not passed in Parliament and therefore was granted assent by the President of India as an executive ordinance. 18 Surcharge may be zero per cent, 2 per cent or 5 per cent depending on the income thresholds. Rate of cess will be 4 per cent. 19 This reduced rate of withholding tax is applicable until 30 June 2020. 20 Subject to fulfilment of certain conditions. Also, this reduced rate of withholding tax is applicable until 30 June 2020. 21 Chief Controlling Revenue Authority v. Coastal Gujarat Power Limited & Ors, Civil Appeal No. 6054 of 2015 (arising out of SLP (C) No. 32319 of 2013). 22 A depository is an entity registered with the Securities and Exchange Board of India to hold dematerialised securities in its system and maintain records for the beneficial owners of such securities. 23 Authorised dealer banks are banks that are authorised by the RBI to deal in foreign exchange in India. 24 http://164.100.47.190/loksabhaquestions/annex/12/AU2287.pdf (last accessed 10 May 2018). 25 See, for example, State Bank of India v. Mr. V. Ramakrishnan and Veesons Energy Ltd., Company Appeal (AT) (Insolvency) No. 213 of 2017; M/s Sicom Investments and Finance Ltd. v. Rajesh Kumar Drolia and Anr. (Summons for Judgment No. 221 of 2010 in Commercial Suit No. 44 of 2010); and Schweitzer Systemetek India Pvt. Ltd. v. Phoenix ARC Pvt. Ltd. & Ors. (Company Appeal (AT) (Insolvency), No. 129 of 2017). 26 Under the Insolvency Code, secured creditors have the option of enforcing their security interests without relinquishing the same to the liquidation estate. In such scenarios, the unpaid debt of secured creditors ranks at par with government dues and below unsecured financial creditors under the liquidation waterfall. 28 https://thewire.in/banking/bankrupt-billionaires-indias-debt-crisis-sparks-feeding-frenzy-amongst-private -equity-funds (last accessed on 10 May 2018). 29 https://economictimes.indiatimes.com/markets/stocks/news/collective-action-on-stressed-assets-sales-by-banks-needed/articleshow/62847064.cms (last accessed on 10 May 2018).